We believe in providing access to diverse, affordable, high-quality performing arts programs, and becoming a season subscriber is the best way to take advantage of that opportunity! Simply choose from one of the options below, and create your custom season for an experience to remember. July 6, 2018 / Same Seat Subscribers: You are a same seat subscriber if you were a subscriber last season, and you want to sit in the same seats for every event. Once you become a Same Seat Subscriber you have first right of refusal on those seats as long as you remain a subscriber. July 20, 2018/ Renewing Subscribers: You are a renewing subscriber if you subscribed with us last season. 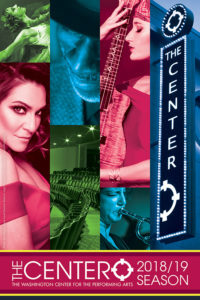 New & Lapsed Subscribers: If you are brand new to The Center, or did not subscribe last season, you will be seated after renewing subscribers, but before single tickets go on sale. These deadliness pertain to seating priority only. Season subscriptions are available until the end of the season. Become a FRIEND of the Washington Center and be seated with the highest priority. Seating priority is given to FRIENDS beginning at the Contributor Level ($100), and increases by donation level.